Department of Botany, Biological Resources and Conservation of Biological Diversity was founded in 1934 at the Faculty of Nature Sciences and Geography. But it existed only for four years, as the faculty itself closed down in 1938. The Department was headed by professor L. Tyshkevych. The Department was reestablished in 1965, as a part of Berdychiv Teacher Training Institute, and later, in 1971, as a department of Zhytomyr Teacher Training Institute. There were established laboratories of Anatomy and Morphology of Plants, Plant Taxonomy, Agriculture Bases, Plant Physiology and Genetics, Geology, Geosciences and Regional Ethnography and Methods of Biology Teaching, Biological Chemistry and Computer Lab. The first years of the department saw new highly-qualified professors on the staff. At different times here worked PhD in biology, associate professors: Volodymyr Porfyrovych Boginich, Leonur Vasylevych Mykhailovskyi, Anton Mykhailovych Okhrimenko, Ivan Dmytrovych Lushenko, Olena Petrivna Zhytova, Nataliia Mykolaivna Korniichyk, Olena Oleksandrivna Annamukhammedova, masters of Agriculture, associate professors: Nataliia Vasylivna Kulakova, Anatolii Danylovych Zhovtonoga, Harrii Oleksandrovych Korbut; PhD in biology, assistant professor Tamara Mykhailivna Panchenko, assistant professors Galyna Fedorivna Dudnyk and Ludmyla Oleksandrivna Uryk, teaching assistants Alla Adamivna Lenartovych, Nataliia Mykolaivna Polishscyk, Mariia Ivanivna Dudar. Associate professor Nataliia Vasylivna Kulakova was the head of the Department during 1965-1973, associate professor Ivan Dmytrovych Lushenko was the head of the Department during 1973-1976, associate professor Anton Mykhailovych Okhrimenko was the head of the Department during the 1976-2000 period. Halyna Kyrychuk — Doctor of Biological Sciences has been the head of the department since 2000. Nowadays at the Department of Botany, Biological Resources and Conservation of Biological Diversity work 13 professors. 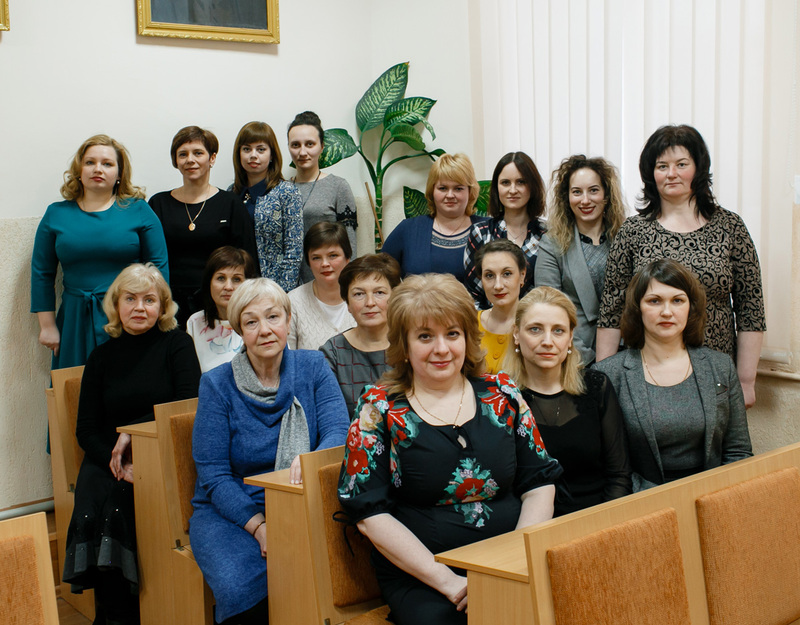 Among them: Doctor of Sciences, head of the Department Halyna Kyrychuk, Halyna Vasylivna Muzh, Larysa Ievheniivna Astakhova, Ludmyla Oleksandrivna Perepelytsia, Yuliia Sviatoslavivna Sheluk, Diana Anatoliivna Harbar, Ludmyla Anatoliivna Konstantynenko, Maryna Konstiantynivna Patsuk, Iryna Oleksandrivna Pershko are Candidates of Biological Sciences, associate professors, Halyna Mykolaivna Mikheieva is an assistant professor, Nina Ivanivna Korevo, Oksana Anatoliivna Savenko, Anastasiia Oleksandrivna Kutyna are teaching assistants. «Conchiology peculiarities of frontgills mollusks Ukraine faunа» (Iryna Oleksandrivna Pershko). The post-graduate course with the speciality 03.00.17 — hydrobiology was created at the Department in 2013. The common research laboratory «Laboratory hydrobiological problems of Ukraine» of National Academy of Sciences of Ukraine Institute of Hydrobiology and Ivan Franko Zhytomyr State University functions at the Department since 2014. The head of it is Doctor of Biological Sciences, associate professor — Halyna Kyrychuk. At the Department are research and problem groups: a research group «Hydrobiological research of Zhytomyr Polissya» (heads: Doctor of Biological Sciences, professor — H. Kyrychuk, associate professor — I. O. Pershko, teaching assistant — A. O. Kytuna), «Botanical Group» (heads: Master of Biology, associate professor — H. V. Muzh and Doctor of Biological Sciences, associate professor — L. I. Astakhova), problem groups: «Taking advantage of problem method of approach within the limits of biological branch of science» (the head is Doctor of Biological Sciences, associate professor — D. A. Harbar), «Achievement and perspective for development of genetical engineering» (the head is Master of Biology, associate professor — L. A. Konstantynenko) «Autoccoids influence on the growth and development of Higher Water Plants» (heads: Doctor of Biological Science, associate professor — L. O. Perepelytsia and teaching assistant — N. I. Korevo), «Structure and functioning vary water objects of Ukrainian Polissia» (the head is Doctor of Biological Sciences, associate professor — Y. S. Sheluk) «Genetical problems solving of up-level complexity» (heads: Doctor of Biological Sciences, associate professor — M. K. Patsuk and teaching assistant — O. A. Savenko) «Development of Cognitive Interest in the process of Teaching Biology» (the head is assistant professor — H. M. Mikheieva). In recent 5 years the Department published more than 210 scientific papers including 32 international research-metric bases (SCOPUS), and took part in 62 conferences, including 37 international ones. 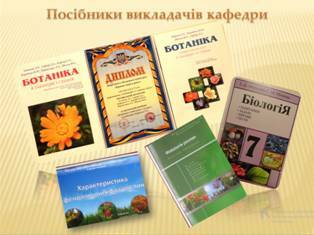 Department professors were published the next textbooks and handbooks: «Botany in tables and outlines: book for scholars of general education, university entrants and teachers» (H. Kyrychuk is honoured with diploma in the competition «Best book 2012»), «Botany (Plants Morphology) in tables and outlines: book for students of higher educational institution» (H. Kyrychuk, N. Korniichyk, Y. Sheluk, D. Harbar), «Genetics», «Genetics and Basic Concepts of Selection» by associate professor I. Lyshenko, «Biology. Questions, problems, exercises, tests. 7 form» (I. Lyshenko, H. Mikheieva), «The Reading-book of Botany», «The Reading-book of Zoology» by associate professor A. Okhrimenko, workbook «Rare and Endangered Species of Animals of Zhytomyr Region» by A. Stadnychenko, H. Kyrychuk, et al., «Hydrologic Aspects of Solving the Problem of Evaluation and Reduction of Threats to Biodiversity in Continental Waters of Ukraine» by V. Shcherbak, monograph «Black Pain of Zhytomyr Region» by associate professor H. Korbut and others. Laureates of Competition «Best book 2012»: L. I. Astakhova, D. A. Harbar, H. Kyrychuk, N. M. Korniichuk, L. O. Perepelytsia, Y. S. Sheluk. Department professors H. Kyrychuk, L. A. Konstantynenko (in association) received two grants for inventions «The method for determination system of cleaning run — off water and quality of their work» (№ 95441) and «The method of number valuation the simplest according to comparative number of their settling phase» (№ 106789). The Natural Investigations Center (Vilnius, Lithuania). The Department maintains international connections with research institutions of Ukraine, Institute Hydrobiology of NAS of Ukraine, Institute of Botany of NAS of Ukraine, The National Academy of Sciences of Ukraine I. I. Schmalhausen Institute of Zoology, Ternopil Volodymyr Hnatyuk National Pedagogical University, Taras Shevchenko National University, Zhytomyr State Agricultural University, Zhytomyr State Technology University, Zhytomyr Regional Post-Graduate Pedagogikal University. Professors, postgraduates and other workers of the Department take part in research conferences, seminars, meetings of Ukrainian and international levels (Odessa, Lviv, Kyiv, Uman, Dnipropetrovsk, Donetsk, Kharkiv, Cherkasy, Ivano-Frankivsk, Kherson, Kaniv, Poltava, Chernivtsi, Zaporizhia), for example, Poland, Russia, Byelorussia, Lithuania, German, Romania, Cheсh Republic, Montenegro. The Department takes part in organization and leading of the II phase of Ukrainian Students Biology Competition. The Department aims at development of the future biologists’ competence. Much attention is paid to the organization of the students’ research work.